სიუზან კეი „სიუზი“ კუატრო (დ. 3 ივნისი, 1950) — ბრიტანელ-ამერიკელი მომღერალი, სიმღერების ავტორი, ბას-გიტარისტ და მსახიობი. იგი იყო პირველი ბას-გიტარისტი ქალი, რომელიც როკ-მუსიკის ვარსკვლავად იქცა. ითვლება, რომ ამან გავლენა იქონია და გარღვევა მოახდინა როკ-მუსიკაში ქალების დამკვიდრების მხრივ. ↑ Sibary, Shona. “In a painfully honest interview, a regretful Suzi Quatro reveals the woman behind the public persona | Mail Online“, Dailymail.co.uk, 2013-07-17. წაკითხვის თარიღი: 2014-04-11. ↑ McCormick, Neil. “Suzi Quatro interview: 'When I zip up, it just feels like me.’“, Telegraph, 27 July 2013. წაკითხვის თარიღი: 2014-04-11. ↑ Auslander, Philip (2006). Performing Glam Rock: Gender and Theatricality in Popular Music. University of Michigan Press, გვ. 195. ISBN 0472068687. ↑ Suzi Quatro, Baroness Manningham-Buller, Sue Johnston. BBC. წაკითხვის თარიღი: 13 November 2013. ↑ Quatro, Suzi  (2008). Unzipped. London: Hodder & Stoughton, გვ. 334–335. ISBN 978-0-340-93751-8. ↑ Auslander, Philip (28 January 2004). 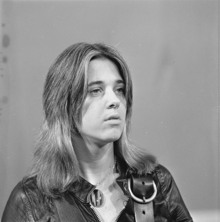 "I Wanna Be Your Man: Suzi Quatro's musical androgyny" (PDF). Popular Music (United Kingdom: Cambridge University Press) 23 (1): 1–16. . http://lmc.gatech.edu/~auslander/publications/quatro.pdf. წაკითხვის თარიღი: 25 April 2012.
ეს გვერდი ბოლოს დარედაქტირდა: 00:07, 7 აგვისტო 2018.